In the room, students openly grieved, sobbed, and shared stories with faculty, hoping for answers about their school’s apparent failure to provide a safe environment for minority students. At the head of the table were Holloway, Salovey and his Chief of Staff Joy McGrath, and Yale Secretary and Vice President for Student Life Kimberly M. Goff-Crews. According to Barlowe, emotions were one-sided. And this, she says, was the precise problem—that after multiple accusations, complaints and petitions about racist incidents, it took a sit-down meeting for administrators to listen, and that even the students’ discernible pain in the room sparked no visceral empathy. Another student told the Yale Daily News that Salovey was “mostly listening” and apologetic, but that she still felt a lack of urgency. Earlier in the day, during an ad hoc encounter on campus, Dean Holloway told a crowd of students, “I’m here for you. I do have your back. Please know that I have heard your stories and I’ll leave here changed.” But the emotional disaffection at the closed-door meeting, to Barlowe, felt like evidence that Yale was unwilling to understand the minority experience—even when it was right there in front of them, in tears. The students were asking for specifics: ethnic studies requirements, a budget increase for their cultural centers, and more minority professionals in the mental health program. The faculty’s hesitation, combined with their delayed reaction to previous complaints, may have been more telling of an intimate knowledge of Yale’s bureaucracy as it was of any failure in empathy; either way, the students felt the punch in the gut twice. While students at Yale have long battled campus racism (in separate instances, swastikas were found on the Old Campus building and inside Vanderbilt Hall last year) many outsiders, including myself, were made newly aware after what allegedly happened on Halloween Eve at Yale’s Sigma Alpha Epsilon. According to student accounts, the SAE member turned away black and Latina students, saying “white girls only” at the door. Barlowe says she heard about it through GroupMe texts the next day. No, Clover, there is no new additional information. Based on what investigators have found so far, the facts show there was no “white girls only” party nor have they been able to validate the allegation. After I covered the initial Halloween frat party story on this site, I got a text from a friend whose close relative is a Yale sophomore: “Call me,” she wrote. She’d been having conversations with her relative about the protests, vigils and prayer meetings on campus. He was forwarding her email updates from faculty. He also mentioned having trouble focusing on classwork; he told her he felt emotionally drained. What’s happening at Yale, and at the University of Missouri, and now Claremont McKenna—it feeds the curiosity of older, non-collegiate Americans who wonder what it’s like to be a growing young person in college in a time of social unrest. I personally wondered what it must feel like to be a black college student in the age of Black Lives Matter, to be constantly reminded of your marginal existence—but now, with a movement behind you. My little brother, a high school senior, was set to tour the school exactly two weeks after the Halloween party. Yale is one of his prospects. He had no idea about the system of exclusion that potentially awaited him, or about the toll it might take. Hearing accounts of some of the brightest, most together college students in America being reduced to tears in front of unfeeling faculty, I felt a need to protect him. So I called my friend. 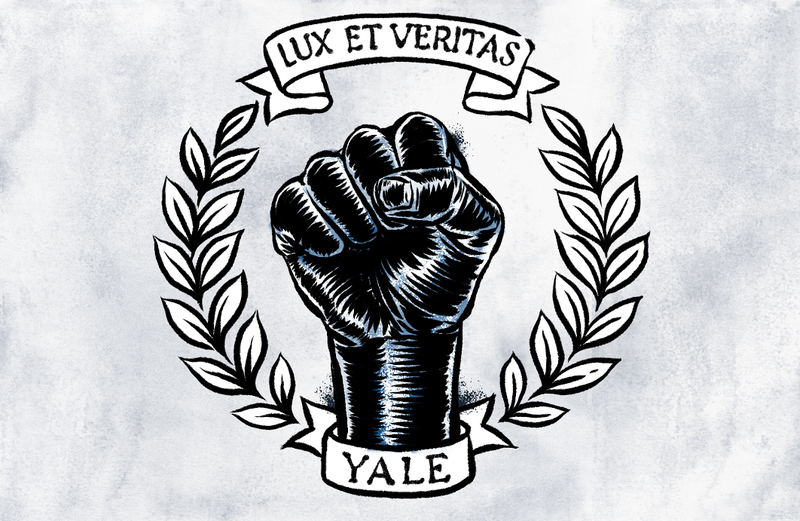 In the sphere of the media, the Yale narrative has since been jumbled, politicized and churned into essays on oversensitivity and the merits of free speech. In some cases, student activists have been reduced to being called privileged millennials; there’s been a stunning lack of empathy that perhaps stems from a lack of knowledge that the burden of living with institutionalized racism is legitimate and real. It’s true that college students are melodramatic, and it’s also true that the world is a racist place. Questions come up at the intersection, inevitably: were these students overdramatizing their experiences? Did they, in a selfish but earnest way, just want to feel part of something bigger? Was there validity to criticism of their tactics as over-policing campus freedom? That type of trivialization is instinctual. It’s also possible to debate the various levels of intent without discrediting the students’ concerns. But what I found impossible to ignore—and what so many reports did ignore—was the aura of grief at Yale and Mizzou. What’s happening at these schools, as well as many more to come, is the sound of systematic ostracism that had formerly operated covertly being unable to do so anymore. Animosity has boiled for centuries at Yale, a university with a 72 percent white student body, 20 percent Asian, 9 percent black and 9 percent Latino (all according to 2014-15 stats). Small moments evolved into movements that lump into an even larger Black Lives Matter umbrella—this era’s echoing civil rights crusade. Yale’s minority students have no reason to ignore their feelings of invisibility and isolation in the middle of a nationwide social climate that appears to finally be validating their experiences on a significant level. It’s may be even worse, in this context, for their actions to be so easily dismissed—by the media, and by Yale itself. In turn, they’ve magnified their actions in the past week to avoid being suppressed. Movements like Black Lives Matter and the palpable threat of police brutality have empowered college students to express their internalized feelings without apology—to understand that the marginalization they face extends, dangerously, all the way up the chain. After a grand jury decided not to indict Darren Wilson for shooting Mike Brown, Yale’s Black Student Alliance organized a Hands Up Walk Out event on campus to march in support of Ferguson. Less than two weeks after the Charleston church shooting and consequent protests over the Confederate flag, Yale students drew up a petition calling for Calhoun College—named after white supremacist John C. Calhoun (a Yale graduate)—to be renamed. Hearing this, I felt impressed and also overwhelmed. It was hard for me to fathom being an 18-year-old today and feeling the gravity of oppression on both a personal and national level, and then having to articulate that confusion. At 18, I was studying statistics and peeing outside bars. Responding to the protests at Yale and Missouri, GOP presidential candidate Ben Carson, a Yale alumni, spoke as if the Constitution should trump a student’s right to exist in a space without caustic threats. “We’re being a little bit too tolerant, I guess you might say, accepting infantile behavior,” Carson told Megyn Kelly on Fox News. Yale junior Cathy Calderón, a student organizer for La Casa, the Latino cultural center, told me that what’s happening at Yale isn’t about free speech—or even about the Halloween party. Barlowe points to the March of Resilience on November 9 as a turning point from sadness to action. Two hours prior to the march’s beginning, the University of Missouri system president Tim Wolfe had resigned in the midst of criticism of the school’s response to its own racist climate. The situations are not parallel between Yale and Mizzou, but similarities keep appearing. Two suspects have been arrested for making threats on Yik Yak at Mizzou, and on November 12, Yale Police also investigated a racist phone threat to the African American Studies department and added patrols. But, as for Calderón and Barlowe, they were eloquent and clear about what they want moving forward. I specifically asked them what a “safe space” (what many students say they’re seeking) would look like. “There’s a lack of institutional support and funding to have a variety of ethnic studies courses on campus. If we had that as a requirement, that would translate into so much more awareness and understanding,” says Calderón. When I tell her she’s not the one getting paid to propose solutions, she sighs and says, “Exactly. Yeah.” She proceeds to do so anyway. “As an Ethnicity, Race and Migration major, we don’t get a lot of support,” she says, meaning both financially and in terms of faculty. “There are faculty who are actively trying to end the program.” Calderón suggests, instead, building the major out into a true department (which it isn’t right now) and adding full-time professors. In 2013, Yale’s Department of Arts & Sciences employed 15.8 percent faculty of color and 74.4 percent white. By 2015, that number had increased to 19.9 percent non-white faculty, and 22.5 percent in the university overall. In a November 3 memo, President Salovey announced a $50 million initiative to broaden faculty diversity, mirroring the belated, often clinical initiatives of workplaces nationwide, including Gawker Media. These faculty divides are irrelevant to students, perhaps hidden to them. In this case, their naïveté when it comes to organizational management works in their favor, at least initially. On November 12, Yale students created a new alliance dubbed Next Yale, to represent minority students. That same night, Barlowe and a group of about 100 people—including allies, BSA members and community organizers from New Haven—delivered a list of demands directly to Salovey’s President’s House and read them to him, before handing it over. The discussion is ongoing about the costume practices that provoked the IAC’s cultural appropriation memo the day before Halloween, as well as the response email from Erika Christakis, who stated that costumes should not be policed. Some students found her “free speech” insertion confounding, since the IAC’s memo was barely critical in tone; it focused on suggestions rather than imposing harsh punishments. As a former preschool teacher, for example, it is hard for me to give credence to a claim that there is something objectionably “appropriative” about a blonde-haired child’s wanting to be Mulan for a day. Pretend play is the foundation of most cognitive tasks, and it seems to me that we want to be in the business of encouraging the exercise of imagination, not constraining it. Anyway, for the students who protested, the bigger problem wasn’t the costumes, but Christakis intervening. Her letter meant once again protecting the offenders at the risk of alienating the school’s most marginalized students. I’m sorry I can’t speak with you now, but good luck with the story. My take, for whatever it is worth, is captured very accurately in this Atlantic article (specifically vis a vis my intent). What they and others disregard is the dangerous implication that minorities at Yale should feel lucky, when the circumstances outside of their school walls have consistently proven otherwise. Yale is not nearly as visible a badge as their skin. You can’t see Yale from a distance. In the past few years, seeing their teenage peers gunned down, these students have been forced to confront the fact that their so-called privilege is limited. Johnson remembers leaving the school’s library during her freshman year and seeing three people wearing white capes and hoods in her path, and hoping it was a practical joke. No one believed her when she retold the story. She also recalls walking into her boyfriend’s dorm room and seeing that his white roommate had a Confederate flag on his wall. Years later, she’s still broken up about a dumb boy with a racist flag who would never get punished as much as Yale’s current students are being critiqued for their demonstrations. Out of all my interviews, hers gave me the most chills. It reminded me of the type of Otherness that follows and eats at you, and often feels too personal to bother vocalizing. After our interview, I sat in the tiny phone room at Gawker for several minutes and stared at a wall. At this point, it doesn’t matter whether or not an SAE member said “white girls only.” It matters, in a practical sense, that the students have called on Dean Holloway for reforms. The faculty has since responded in emails, with statements to current students and alumni, some of whom have sent around an open letter to administrators. As Dean Holloway wrote this morning, Yale belongs to all of you. Yale must be a place where each person is valued automatically, without having to demand or labor for that recognition. I do not want anyone in our community to feel alone, disrespected, or unsafe. We must all work together to assure that no one does. Our community also shares a commitment to free expression and an open exchange of ideas free from intimidation...Now is a time to work toward healing and mutual understanding. For Barlowe, the diplomatic language in the emails is disappointing. “They’re like: We want to respect diversity and we value all the different people of our community and we also value free speech. They’re trying to make everyone happy. For me, that’s actually not going to work anymore. We need to be explicitly prioritized.” That would mean seeing her administrators react swiftly to racist incidents, as well as support mental health programs that acknowledge that students of color have a different experience at schools like Yale. Yale has four cultural centers on campus, one each for black, Latino, Asian American and Native American students. Barlowe says these places have been crucial sites of comfort. In hopes of spurring dialogue, the cultural centers organized a teach-in called “A Moment of Crisis: Race at Yale Teach-In,” held on November 11. Discussion topics included: Valuing Women of Color at Yale, Mental Health and Its Impact on Communities of Color, Addressing White and Male Privilege, and The Importance of Taking Ethnic Studies. Over 1,000 people attended, including white male students who participated in a panel on white privilege. Yale senior Molly Zeff told the Yale Daily News, “This is a fight that’s only going to be possible if the people who most benefit from systemic racism, which include myself, are fully aware of the people who most suffer from systemic racism.” That the teach-in was organized by the cultural center—and not the university at large—highlights where Yale ultimately fails at initiating discourse from the top down. The same week as the March of Resilience, the hashtag #blackoncampus started trending on Twitter, encouraging people to share their experiences of being a black student at a predominantly white college. Reading it, I remembered how, as a transfer student at NYU, there was rarely a day that I didn’t feel like a minority. Almost every class reminded me of it. Professors would occasionally mix up the names of me and the one or two other black women in the room. I chose to live at home with my parents, which allowed me to avoid ridiculous housing costs and, in effect, much of the entire campus culture. When asked, I say NYU was a great educational experience with a great journalism program. It was not so much a great personal experience. In comparison, my freshman year at Temple, a much more diverse school, was one of the best ever. And it was my avoidance of campus life at NYU that allowed me to dodge much of the structural racism that permeates everyday existence at a small or isolated college like Yale. Johnson says it’s normal for minority freshmen to turn a blind eye to seemingly minor racist incidents. Head down and focused.